Selecting just five recipes for this post was actually harder than I thought. What to make, what to bake….and most importantly, what to eat?? Stollen, there will be definitely some of this. 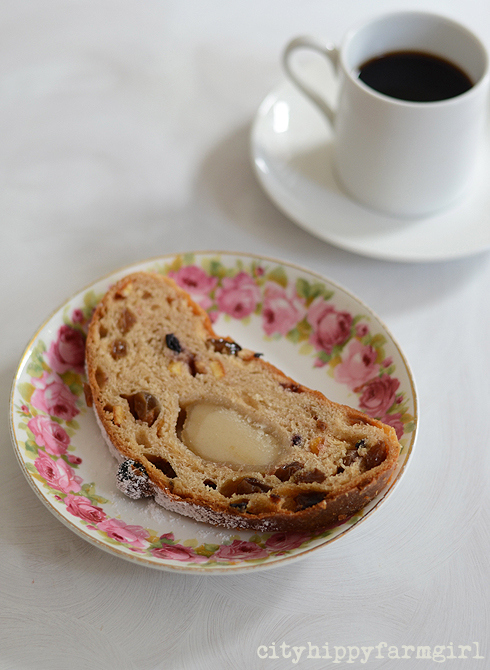 Stollen involves, dried fruit, marzipan and really….that is just a match made in heaven. This ice cream, as it was a sure hit last summer, and I’m always up for easy crowd pleasing dishes. I think I will have a play with some St Lucia saffron buns. I’ve been making quite a few Cinnamon Buns as they are easy, freezable and everyone enjoys them, but I would like to branch out a little and see how the saffron buns turn out. This family favourite will probably get a look in….as really, I’d be crazy not to. And lastly, sourdough doughnuts. I’ve been planning, and planning this one, working out my best point of attack. I’m going in people, and will not rest until they are sitting plump on the table, surrounding by happy expectant faces….or at least my one satisfied one. What are you making over the next few weeks? This entry was posted in Food Glorious Food and tagged christmas, coconut, custard tart, icecream, mango, sourdough doughnuts, stollen, vegan by cityhippyfarmgirl. Bookmark the permalink. The mangoes are delicious this time of year aren’t they. Slightly green, and gives a little squint to the eye when you bite down on it…that’s how I like em’. Sounds good Sara. What time shall I come over? Jane, another blogging friend is currently doing a fruit mince score challenge at his work place. Just looking at the written out score board was very impressive…I do love a healthy dedication to fruit mince pies! See you on the other side for the St Lucia buns? Sam that sounds divine! I’d love to be in France for Christmas…or January would be fine too…come to think of it Feb could be good…March would obviously be lovely…April…May….sigh. You get the picture. Happy Xmas to you too lovely. Your pictures are just so incredibly stunning. You could make garbage look delicious, I swear! That ice-cream recipe looks good, I’m going to try it subbing maple syrup for the sugar, I’ll let you know how it goes. Rose I think honey would be absolutely fine too. Maybe ditch the mango and try another fruit? Thanks lovely…I think I might need it. Good to know you have a stollen recipe – I have swithered over making some – usually make cranberry buns for christmas day – wondered about doing them sourdough, also must make more mince pies. Good luck with the doughnuts – it is another recipe I would love to make with sourdough so hope to hear how you go. Yep fingers crossed for the doughnuts Johanna…maybe toes too. 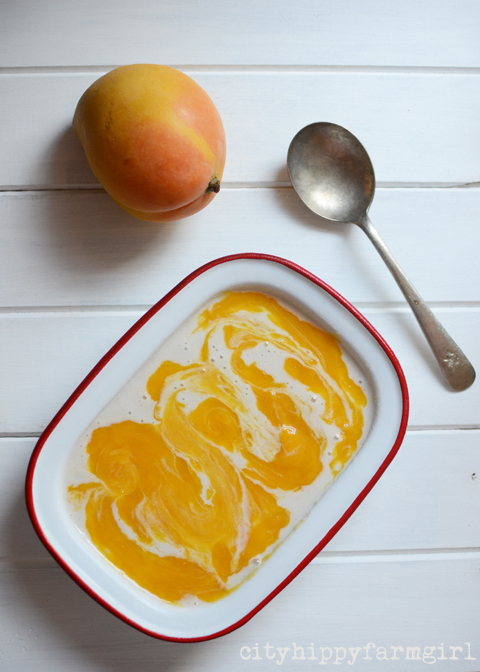 Your mango dessert is our kind of summer ice cream. I’m thinking I’d like to try something with cherries. I’m squealing in delight over your sourdough donuts. Please open an online shoppee! Wouldn’t that be fun Zena! Have you seen this beautiful company? http://winnieandco.com/pre-order/ so lovely. 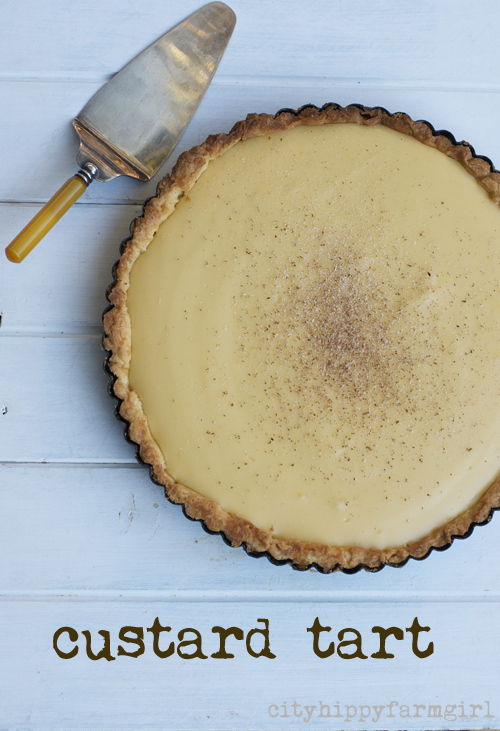 You have set off a craving for custard tart 🙂 These all look and sound lovely. That’s an amazing cherry price, and cherry jam, one of my all time favourites…for ever. Pipping the little buggers though? Well that’s another story. I hope you have a great Christmas at CHFG head quarters. Thanks Richard, right back at you.